After a period of research, that has stretched over one year and a half, we are in the phase of intense preparations for the first full scale interactive version of Fugue, that will be premiered in ULUS Gallery in Belgrade, 19 July – 1 August 2006. During this period of time, in parallel with research process, we have exhibited and presented intensively prototypes. Working toward a ‘tuneable’ interactive piece, which has been one of our goals, the interaction in Fugue is controlled by sensing the presence and movements of the participants. This is done using a system developed for Fugue by Richard Newcombe at the Department of Computer Science, University of Essex. 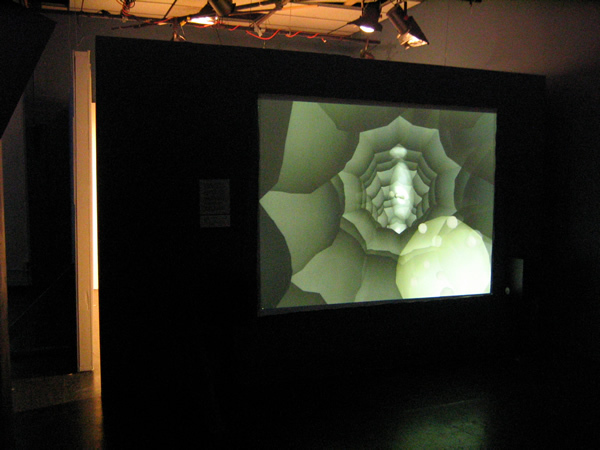 An overhead camera sensitive to infra red light sends a video stream to a custom-designed software package which uses a combination of adaptive particle filtering and real-time computation of visual flow to extract the information specified by the artist. This information is then passed to the AIS software where it modulates the development of the central algorithm, influencing both the visuals and the sound. 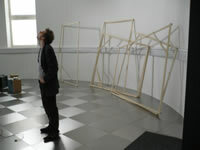 Zoran Milkovic's sketches of the Fugue installation. 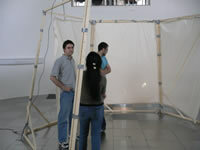 The project is grateful to the Department of Computer Science at the University of Essex for the provision of the space, equipment, and technical resources to support the development and testing of the final prototype of the full scale exhibition in Belgrade. Special thanks go to Professor Owen Holland, and to Renzo De Nardi. Work in progress during the second and third weeks of June 2006. 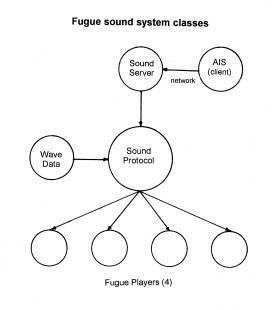 This is a rather technical outline of some aspects of Fugue's sound software. While it may not be for everyone I hope it can assist, in some small way, the listening experience. To begin, Fugue's sound software is based around a series of customised audio players ("Fugue Players") that respond in real time to changes within the Artificial Immune System (AIS). 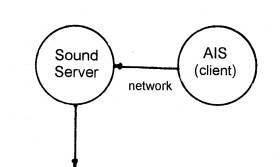 The sound software is designed to run on a separate computer, which is networked with the AIS's computer, although both systems will run on the same machine and have done so in presentations to date. The audio players are part of a larger collection of java classes making up the Fugue audio system. These include Server, Sound Protocol and Wave Data classes. I also wrote a Client class to simulate the AIS for development and testing. The relationship between the sound System classes is shown below. What follows is a brief description of each. In Fugue, communication between the Artificial Immune System and the Sound System is through a standard network connection. An array of variables is passed to the sound system at regular intervals, representing a 'snapshot' of what is happening inside the AIS at that particular time. With the distances involved in our collaboration we decided that I would use a simulation of the AIS in Melbourne, to establish a way of working independently of the Fugue hardware which was situated in London. Updates to the sound software could be emailed and tested on the system there. In London, output data from the AIS could be captured into a text file while it was running, and emailed to me. My client software then, was designed to read this authentic AIS output and send the information to the Sound Server at regular intervals just as the AIS would. 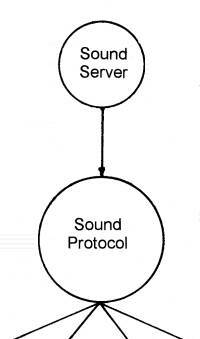 The Sound Server is a workhorse class that makes a network connection with the AIS, and passes incoming data arrays to the Sound Protocol class (below). Some rudimentary error checking is also carried out here. In this class the data array, or 'data state' of the AIS is compared to its previous stored counterpart to detect which values have changed in the mean time. If any, the new values are passed to handler routines which are designed to effect a change in the sound. 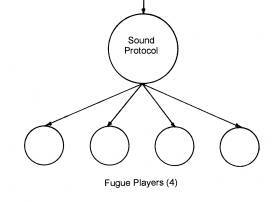 The handler routines are the composition and performance procedures for Fugue's sound. The role of the Sound Protocol class is to parse and analyse the AIS data state and initiate a suitable change in the sounding process. The logic here is infinitely extensible and serves to bind AIS events to relevant sound processes. An example of a data parsing procedure is to register changes in the direction of growth of particular immune system cells over time. This class contains composition data such as wavetables, useful index points, sequencing and other information. Currently only vocal samples are used in the sound design, and stored as 16 bit, 44.1kHz mono samples. 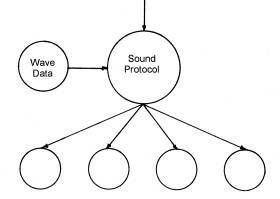 This data is used by the Sound Protocol class' handler routines to control the audio players in real time. The Fugue Player class contains most of the functionality associated with the audio construction and rendering. This is because it is a customisation of a general purpose audio player used in my other work. The functionality includes start, stop, volume and pan controls, as well as dynamically loading and sequencing wavetable information. The player has an internal sound buffer making it useful for direct sample manipulation. A granular synthesis provision is to be added in future. While four Fugue Players are shown in the diagram, up to 16 may be used. The disk size of the Fugue audio software including audio samples is currently around 300kB, this small size making it ideal for distribution over the internet. The customised audio player concept challenges the phonographic paradigm, of which audio CDs or internet streaming files are examples. Here, instead of the mechanical playback of fixed sound data from a disk or file, the audio player combines and renders source wavetable information in real time, providing a listener with the possibility of a unique and customisable listening experience. The aim of creating a scientific tool strongly underlines the scientific aspect; however from the point of view of the two artists involved in the creative process, Fugue is an integral interactive art project. Yet, from the scientific point of view, it is essential to ensure the scientific correctness of the underlying model. Will it be art, or will it be science? Our claim is that the first responses to the [first] prototype [Algorithmica] made it clear that it may be seen as either, depending on the perspective of the user. A period of time developing the twofold concept of an artwork and a scientific tool was summarized in the in the paper titled: Fugue: an Interactive Immersive Audiovisualisation and Artwork using an Artificial Immune System. At this stage, our research has shifted to the artistic facet. Gerald Edelman's Bright Air, Brilliant Fire , together with Richard Wurtman's articles on the influence of light on the human body opened a new path for this research. Perhaps the most important recent reading has been Shaun Gallagher's interdisciplinary book How the Body Shapes the Mind (2005). Firmly grounded in the philosophy of M. Merleau-Ponty, and current scientific achievements across disciplines, it opens new views on consciousness, particularly embodiment, the complexity and inter-sensory nature of perception. Liberation from the exclusivity of the conventional 'white cube' gallery space offers the possibility of situating an artwork in various environments, and provides the potential of assessing it as a natural, yet to a great extent controlled, experimentation space. In the groundbreaking The Talking Heads Experiment in 1999, a scientific laboratory, in collaboration with artists and art curators, was transposed into an art event, and the general public was invited to actively participate in scientific experimentation with AI. We intend to make transparent the research process of creating a work of art, rather than transforming a scientific laboratory into a gallery, or exhibiting space. Fugue project has opened the process of building an interactive installation that applies AI, conceptualized as an artificial entity, into the space open for active artistic and scientific participation as well as for the wider audience over the internet. In the recent emerging diverse forms of bio-art such as works by Eduardo Kac's and Oron Catts as examples - the ethical issue is one of the focal questions. Yet again, the focus is mostly on the technology and the ethics of treating living matter as a means of artistic expression; a challenging, even bizarre interface. Our focus shifts from the technology and interface, although carefully designed, to the body of a participant. I ask myself the question: what happens in the participant's body; a body defined in terms of existential phenomenology: of no distinction between body and mind, in the constant process of becoming through interaction with the world, the body that ï¿½I am', to paraphrase M-Ponty. We have already conceptualized the current, second prototype, which fully integrates the sound elements into AIS mediated visual modules, well grounded in the role of hearing in visual perception. It was first presented and exhibited at NewForms05: Ecologies festival and conference, Vancouver , September 2005. In the next research phase, we intend to apply previous experiences with a large-scale customized screen Infonoise working toward more complex inter-sensory experiences within an interactive environment. We plan to experiment with using so-called ï¿½artificial skin', usually developed for robots, as a material for building the installation. This will create an intelligent interface capable of memorizing and learning as another AI element to be incorporated into the complex architecture of the Fugue . From the experience with the Infonoise installation, we have learned that the environment that differs from the rectangular projection, regardless of the number of screens applied, brings an entirely different experience and response. The element of touch is expected to induce spontaneity, curiosity and a more direct, intuitive, non-cerebral participation. On the other hand, this would provide data for the AI that would induce evolving changes within it, rather then responding in a predefined manner each time. 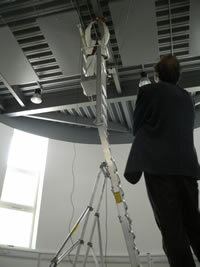 Our quite ambitious quest for parameters for ï¿½calibrating' an interactive artwork continues. We will further research across disciplines the scientific knowledge on the influence of technology on the human body alongside developing the artwork through prototypes. The anticipated long-term outcome will be the first experimental immersive environment with a ï¿½product specification', which in this case will be written in terms of the impact on the participants' body. Gallagher S, How the Body Shapes the Mind (2005). Oxford University Press (March 2005. Fugue is the result of a collaboration between artists, new music composer and computer scientists. The result is an on-going project which provides a new way of communicating complex scientific ideas to any audience. Immersive virtual reality and sound provide an interactive audiovisual interface to the dynamics of a complex system ï¿½ for this work, an artificial immune system. Alongside with providing the greatest immersive effect currently available, this technology offers the potential to control and calibrate particular audio-visual elements. The aesthetics of the Fugue is emergent, based upon the essential, fundamental and hidden beauty of the organic processes manifested through the dynamics of the real-time generated, unpredictable algorithm. 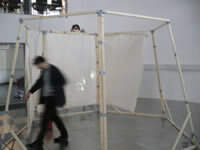 The piece is set up as an interaction between a virtual (artificial) immune system and a human participant. Participants are able to see and interact with immune cells flowing through a lymphatic vessel and understand how the complex dynamics of the whole are produced by local interactions of viruses, B cells, antibodies, dendritic cells and clotting platelets. The sound, envisaged as a ï¿½mental soundscape', a resonance of the function of immune system in the body, provides a major channel for interaction. By overlaying and modulating the sonic pulsation, cycles - such as circadian rhythms, or other inputs such as stress level, will be introduced in the future. 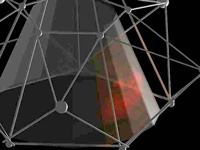 The Artificial Immune System will ï¿½inhabit' the virtual space of the master server computer at the CS UCL that will run the Artificial Immune System continually, providing the possibility of being displayed on different interfaces. 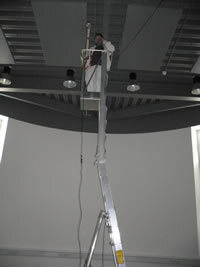 Artists and scientists are both concerned with understanding the world and our being in the world; but while the view of the scientist is rooted in consensus and endeavours towards objectivity, the artist emphasises the values of the personal and subjective investigation of philosophical questions. Such a dichotomy suggests potential conflict: does the participation of an artist in the communication of science run the risk of introducing some bias antithetical to the very idea of science? And if so, can this potential conflict be managed satisfactorily within the collaborative process? Taken together, these two questions raise a wide range of issues, and as yet there are no definitive answers. The Fugue Project aims to frame and focus the questions in the context of transdisciplinary collaboration in the area of representing the functional dynamics of one of the most complex systems known ï¿½ the human immune system. This will be achieved by the creation of an immersive virtual reality immune system, which enables participants to interact with and understand various cellular behaviours inside a lymphatic vessel. The hope is that the information uncovered by this research will help to structure future more comprehensive investigations of these fascinating and important issues, for art and science. We propose that the best way of enabling both scientists and non-scientists to understand a complex functioning system is not just to present it to him as a spectacle, but to engage him as a participant, and to enable him to interact with the system in a multisensory way, directly appreciating cause and effect, variability, intrinsic dynamics, periodicity, and so on. To achieve this, direct input from an artist and a composer is used to guide the visual and audio experience. In other words: we propose to exploit artists' knowledge of the relation between interactivity and perception, and harness it in the communication of scientific complexity. Audiovisualisation offers significant advantages for understanding hugely complex systems: it offers a much wider bandwidth than vision alone, and engages both serial and parallel modes of perception. In addition, the intention is to explore the potential of contemporary Virtual Reality technologies for enabling users to actively engage with the production of phenomena, rather than merely observing them passively, within a custom designed virtual reality environment. The user will be able to control certain parameters of the modelled immune system, and will also be able to choose the particular function, particle, or interaction to follow. The basic concept tests the form of the interaction between the sound and the vision in a way that is inspired by the complexity of one of the greatest musical forms: the art of fugue. The art of fugue is a highly disciplined form of composition of complex structure and exact relationship of parts. 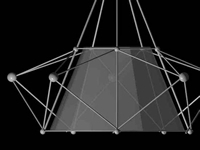 The title ï¿½ Fugue ï¿½ serves as a metaphor for the transdisciplinary nature of the project, and for the method applied: of inter-weaving the different perspectives of artists and scientists, different aesthetics, various skills and expertise, and personal philosophies, and uniting them into evolving poly-phonic synergy. The emergent, evolving nature of Artificial Immune System algorithm, repetition as a succession of variations of ï¿½events', and the complex structural and functional interrelationship of the particular elements and processes that can be related to the counterpoint, was one of the inspirations for the fugue concept. The Artificial Immune System software creates the dynamics of the virtual immune system drama, and also constructs and implements the architecture of the Fugue by providing the functional structure for the communication channels between the visuals and the sound. 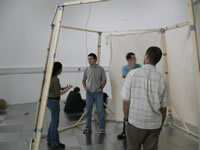 On the other hand, this method is well grounded in the already successfully applied artistic method of interweaving, cross-connecting different specialists and specialisms, in an effective cross-disciplinary framework for the emergence of synergy through collaboration; a method resembling the structure of the fugue. 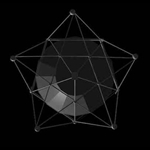 In parallel with providing the functional structure for the communication channels between the visuals and the sound, the Artificial Immune System algorithm is a bridge between the scientific and artistic aspect of the project. Finally, the fugue structure helps us to achieve one of the major aims, by not only rep-resenting all the processes involved, but also at the same time painting a larger picture of the role of the immune system in the functioning of the human body and mind. This will illustrate the immune system's intimate interconnectedness with the total sum of particulars that constitute each human being. This approach affirms holism as one of the fundamental principles of transdisciplinarity, as seen for example in the neurophenomenology of Varela, Maturana, and Thompson, and the biology of Margulis and Goodwin. Because are working towards facilitating a better understanding of the function of the immune system, rather than simply creating 'beautiful imagery', much of our work has been concentrated on processes. The aesthetics of the Fugue is emergent, based upon the essential, fundamental and hidden beauty of the organic processes manifested through the dynamics of the real-time generated, unpredictable Artificial Immune System. The immediate target for Fugue is to move from the current desktop-based demonstrator to a full-sized system capable of withstanding the rigors of exhibitions. 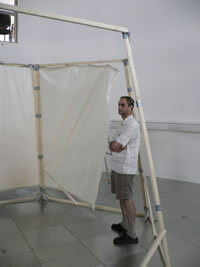 Figure 1 provides an illustration of a possible exhibition installation. An overhead LCD projector and surround-sound speakers will provide the main output, to be experienced by several participants simultaneously. One or more free-standing rotatable LCD ï¿½windowsï¿½ will also be placed in the arena (the exact number depending on the floor area available). These will provide individual views into the same virtual world and permit views from different players in the system (i.e., from a B-cell, or a virus). 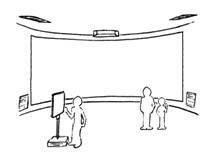 By rotating the window, the participant rotates their view within the virtual world, enabling interactive control of their immersive experience. The LCD windows will be constructed for the Fugue project and will comprise 17 inch LCD monitors mounted in metal stands, rotatable through at least 300 degrees, with rotation measured by optical sensors and fed back to the server. Two servers are used to run the Fugue software: a graphics server, which calculates the artificial immune system and corresponding three-dimensional visualisation, and a sound server to calculate corresponding audio. The servers are networked together. Communication between the servers is through TCP/IP. Output from the graphics server feeds to an LCD projector (and the free-standing screens if installed). 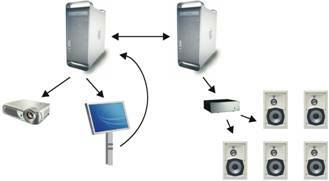 Output from the sound server feeds to a surround-sound amplifier, which is linked to a minimum of four speakers. Input from sensors such as the window rotation sensors is fed to the graphics server, see figure 2. Figure 2. The Fugue hardware comprises graphics server (top left) driving projector and VGA screens, networked to the audio server (top right) driving amplifier and speakers. Brown, M. H. and Hershberger, J. (1991). Color and Sound in Algorithm Animation (Technical Report No. 76a). DEC Systems Research Center . Christian Jacob, Julius Litorco and Leo Lee 2004. Immunity through swarms: agent-based simulations of the human immune system. In Proc. of the Third International Con-ference on Artificial immune Systems (ICARIS 2004), Catania , Sicily . pp. 400-412. Ruiz M., Buxton, B.F., Douros I., Treleaven, P.C., "Web-based Software Tools for 3D Body Database Access and Shape Analysis", Scanning 2002 Proceedings, Paris, May 2002. The concept for the Fugue project emerged as a spin-off from the work on the Art Council England-funded prototype for Algorithmica , a large-scale art work partly inspired by the immune system. When Dr. Bentley, a specialist in artificial immunology and collaborator on the project, showed the visual model produced for the art work to some practicing immunologists, their strong interest suggested the possibility of developing a new method for the visualisation of the immune system, giving equal weight to art and science. 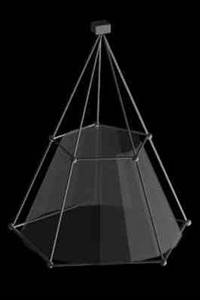 The prototype was presented to several varied audiences immediately after its completion. This instant positive response generated our strong enthusiasm for developing a new project ï¿½ an immune system audiovisualisation. Soon after this, Dr. Julie Mcleod, a consultant on immunology, joined the core team. The human immune system is so complex that it is currently impossible to produce a tractable model of the whole. Nevertheless, computational models are increasingly been seen as important tools to aid our scientific understanding. Separate from immunobiology, the field of artificial immune systems has grown dramatically in the last five years. Artificial immune systems algorithms are computer programs modelled on different aspects of the human immune system and used to tackle a wide variety of problems, from computer virus detection to data mining, to robot control. Additionally, in recent years issues of public health (from simple allergies to the expansion of AIDS and recent global epidemics of extremely dangerous flu variations) have led to in-creased and widespread public interest in the immune system. There is a clear need for the lay population to be much better informed about the operation of the one of the most complex and enigmatic biological systems. Audiovisualisation is still a new methodology for presenting scientific findings. 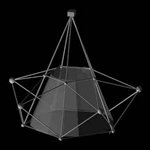 Only one virtual reality approach, Planetary Seismology (a Virtual Reality audio/visual representation of seismic phenomena) produced by the German scientist Dombois in 2001, is available for participants at present. Only a handful of immune system visualisations currently exist. They have all been produced exclusively by scientists (Steven Kleinstein, IMMSIM, 1999; Christian Jacob, 2004), and the presentational styles are barely accessible to non-experts. (For example, IMMSIM uses a very abstract 2-dimensional lattice representation based on cellular automata.) To date, these visualisations have been presented only within a closed circle of scientists and have not been released for the general public.